Ginger High- Books R Us: ENTER THE NFL SUPERBOWL GIVEAWAY-WIN A NFL STORE GIFT CARD! 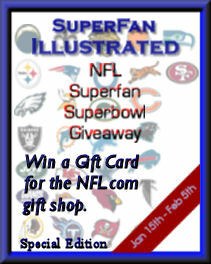 ENTER THE NFL SUPERBOWL GIVEAWAY-WIN A NFL STORE GIFT CARD! We all are! We have a wonderful giveaway in store for you! Capri's Coupons , Coupon Frenzy Mom &; Debbie Does Coupons teamed up with some AMAZING bloggers to bring you this NFL SuperFan Superbowl Giveaway!! You will have a chance to win a Gift Card to the NFL GIFT STORE!! Excited yet??? We decided to have a SUPERBOWL of our own!! This will be for Twitter followers, so if you don't have a twitter account, set one up so you will be ready to enter this amazing event!..It's Free and easy to set up an account. Up for Grabs is (1) First Place $150.00 NFL.com Gift Card, and (1) 2nd Place $45.00 NFL.com Gift Card. So who will win our Superbowl??? Could be you. This giveaway will go live on the Jan 15th and end on Feb 5th!! Simply fill out the Rafflecopter form, there are Mandatory entries that need to be verified before you can unlock the bonus entries! Good Luck Everyone! We love the Giants here! I'm hoping to win this for my son, and his favorite NFL team is the Detroit Lions! I hate to admit it but it's the Kansas City Chiefs. My house is Bears fans!! !